Mirror Screen makes it possible to connect compatible applications and content from your smartphone onto the touch screen of your vehicle. It's convenient, easy and safe to use. Once your smartphone is connected to the car, the touch screen display is adapted so functions can be used whilst driving. Your journey remain safe. With Mirror Screen, your smartphone and the touch screen of your Citroën are one. Your favourite applications are now accessible anywhere, including your car journeys! Mirror Screen replicates the display of the apps from your smartphone onto the touch screen of your Citroën. You just have to connect your smartphone using a cable then activate the Mirror Screen mode on the touch screen. Mirror Screen uses your smartphones data subscription and does not generate any additional subscription expenses*. In addition to providing better visibility than on the original screen of your smartphone, Mirror Screen allows you to interact with your applications in full safety: You are able to launch a web-radio, send and receive SMS (or have the message read to you) by voice command or gesture, all without taking your eyes of the road! If you use an iPhone, Apple CarPlay™ offers an intuitive way to make calls, use Maps, listen to music and access your messages, using your voice or a finger. Without taking your eyes of the road, you can activate Siri voice recognition starting from the touch screen of your car or by keeping the voice control button under the steering wheel pressed. Siri will give access to your contacts, make calls, listen to and manage your messages, all without looking at your iPhone. Apple CarPlay™ also lets you enjoy some audio applications like Spotify or Stitcher whilst driving. To use Android Auto(™), you need a vehicle or a car radio installed after purchase that is compatible with Android Auto (™) and a smartphone equipped with Android 5.0 (Lollipop) or a later version. Download the Android Auto application on your smartphone from Google Play store beforehand. When you connect your compatible Android smartphone to your vehicle or car radio, your applications will be displayed on the screen thanks to Android Auto (™). For more information about the compatibility of Android Auto (™), please visit support.google.com/androidauto page. 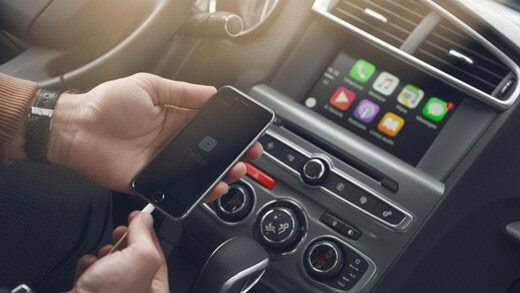 The applications run on the smartphone, but are displayed on the screen of your vehicle whilst the apps sounds are played on the integrated audio system of the car. A whole range of applications used in everyday life can be replicated, in a format adapted to driving, to allow you to interact with them more safely.